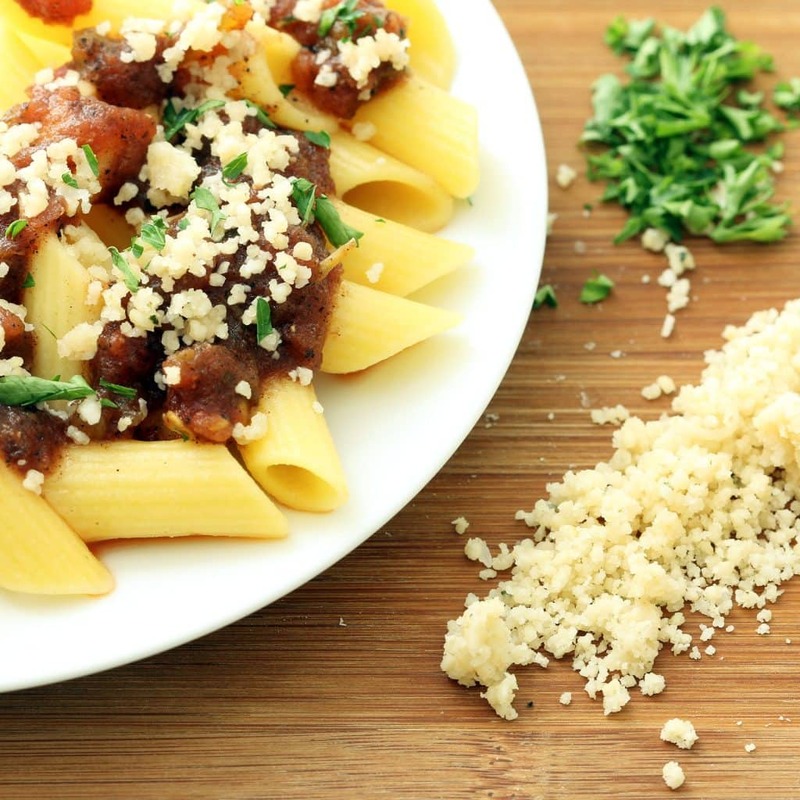 Vegan Parmesan Cheese with an authentic taste and texture! 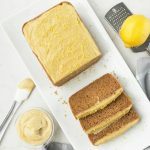 Five minutes and 5 ingredients is all you need — and no yeast flakes! Traditional Parmigiano Reggiano is regarded as having a hard, gritty texture and a fruity, nutty taste by most cheese connoisseurs. My Vegan Parmesan is exactly that! Parmesan Cheese was never on my short list of recipes for a plant-based re-creation. Not that I don’t love it and miss it dearly, but all of the vegan versions I have tried so far have fallen so short of tasting like the real thing that I was not encouraged. 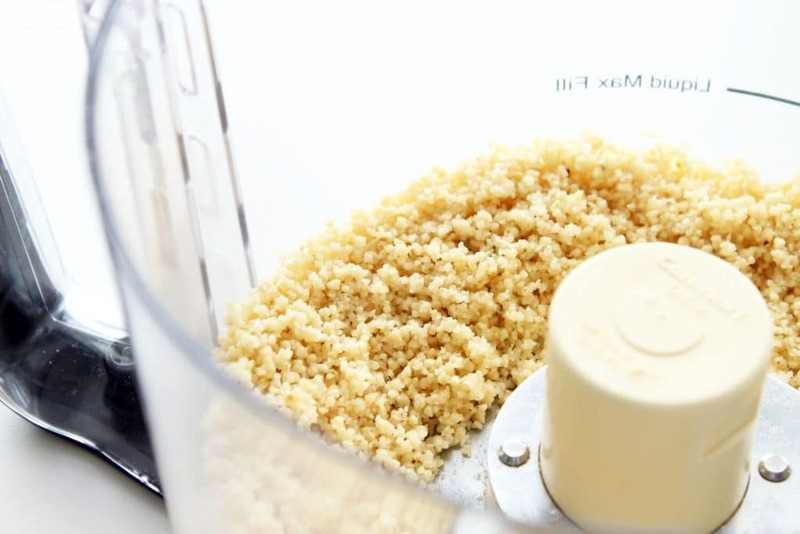 Vegan Parmesan Cheese without Yeast Flakes! 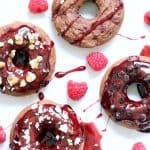 Most of these recipes include nutritional yeast flakes — not that there’s anything wrong with them! Yeast flakes get high marks on the nutrition scale and add a great dimension when added to certain recipes. Maybe it’s just me, but I really don’t like tasting nutritional yeast in vegan cheese. I knew that re-creating this cheese to be a delicious vegan version of the traditional one would not be easy. But it had to be done! Far too many times I have found myself longing to sprinkle some of that cheesy goodness on a warm dish of pasta and marinara, a slice of pizza, or Caesar salad. The members of my household that still eat traditional parmesan were amazed with my Vegan Parmesan Cheese. I had to do a little coaxing to get them to try it, but once they did they became true believers! Life is now just a little more complete! Grating Cheese: If you prefer uniform shreds, it will compress nicely into a hand-held crank cheese grater and grate just like its non-plant-based counterpart. Rice Flour: If you prefer a drier, more granulated parmesan cheese, I recommend adding in rice flour 1/4 teaspoon at a time until desired texture is achieved. 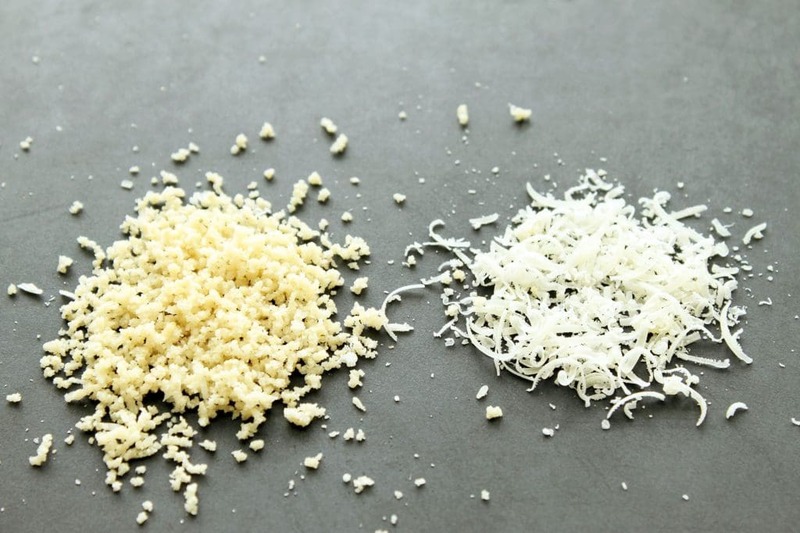 In the image below, my Vegan Parmesan Cheese is on the left and traditional Parmesan Cheese (courtesy of the members of my household that do not adhere to a strictly plant-based diet) is on the right. I hope you enjoy this recipe as much as I do. Try it on my Baked Vegan Eggplant Arrabiata, Homestyle Marinara, or Vegan Italian “Meatballs”! Mangia! 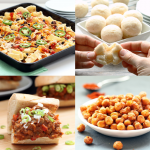 Check out my other plant-based cheese recipes here! 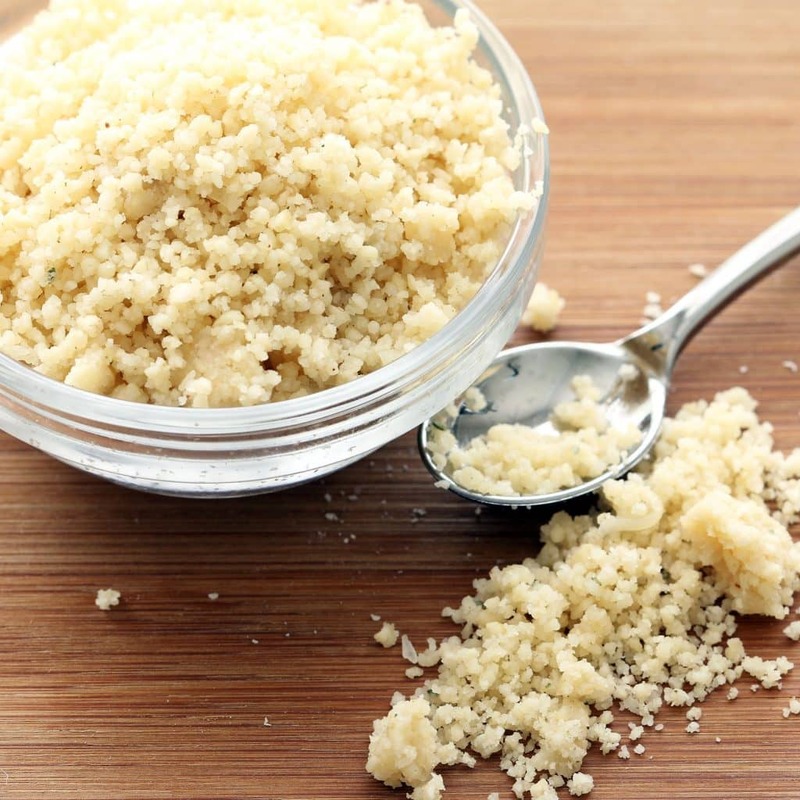 Vegan Parmesan Cheese with an authentic taste and texture! 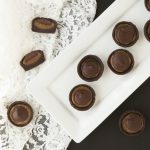 Five minutes and 5 ingredients is all you need--and no yeast flakes! 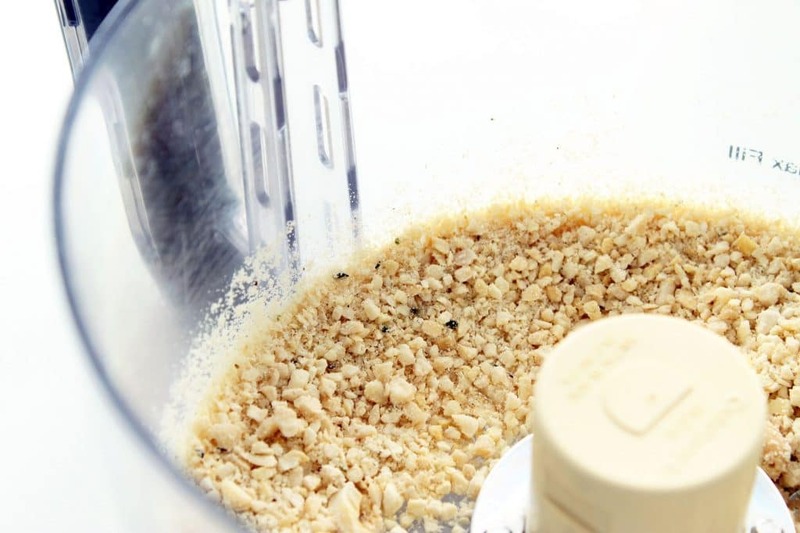 1) Place raw cashews and raw shelled hemp seeds in a food processor and grind into very small pieces (see picture in post). It is important not to over grind or you will end up with butter. 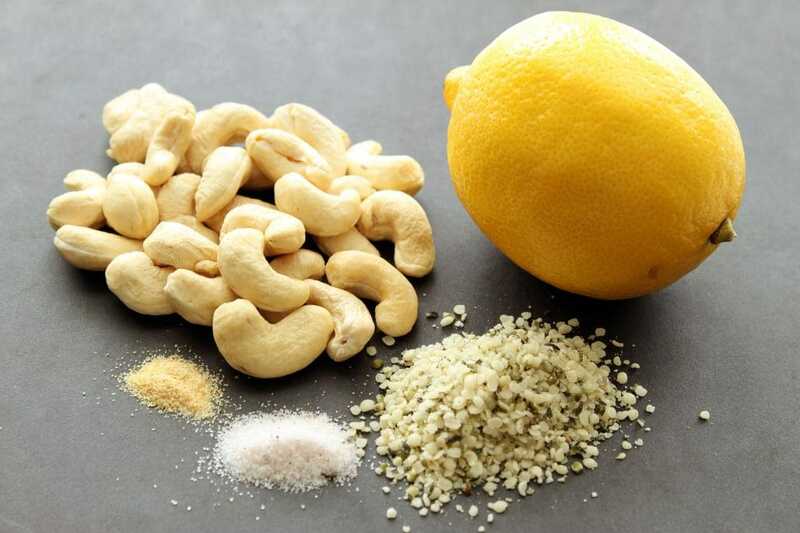 2) Add salt and garlic powder, sprinkling evenly over cashew mixture. Pulse a few times to mix together. Sprinkle in lemon juice and blend for only a few seconds, just until mixed well. (see picture in post) Store in an airtight container in the refrigerator. Add rice flour 1/4 teaspoon at a time until desired texture is achieved. 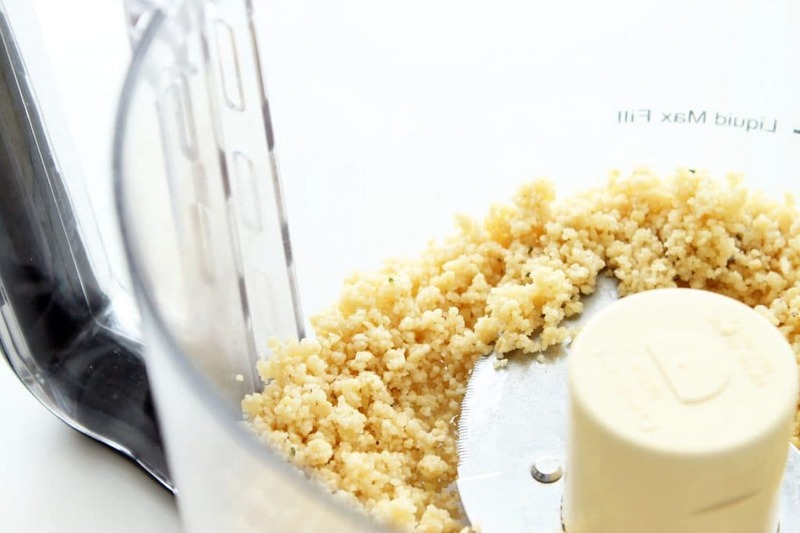 If you prefer uniform shreds of Vegan Parmesan, it will compress nicely into a hand-held crank cheese grater and grate just like its non-plant-based counterpart. If you prefer a drier, more granulated parmesan cheese, I recommend adding in rice flour 1/4 teaspoon at a time until desired texture is achieved. Really delicious! I usually make mine with nutrition yeast but this one is really great too! Thank you! Hi I was just wondering if you could pack it into a ball without the added rice flour? 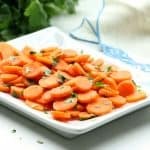 My sister and brother-in-law are vegan so I can’t wait to try this recipe! What if you don’t have hemp. Will sesame seeds or something else work? Hi Jana – how long can the cheese be kept in the fridge after prepared as above? Hi Mary! The parmesan cheese will keep for quite some time in the refrigerator. Refrigerating nuts increases their storage longevity and of course, the fresher the cashews the longer it keeps. I have used mine up to two weeks after preparing it. It would probably go longer but I always eat it up before then 🙂 A good rule of thumb if you are unsure is to smell it and look for any evidence of mold. If it smells ok and looks ok then it’s probably good to go 🙂 I hope this helps! 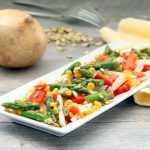 Will hemp hearts suffice, as opposed to hemp seeds? Thanks so much for this recipe! 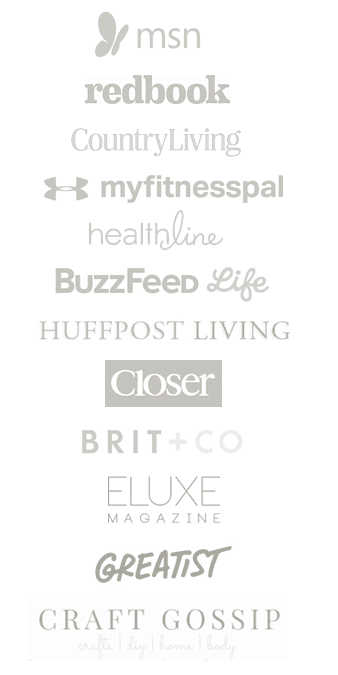 My husband is gluten-free, dairy-free, and nut-free, and has been craving cheese. I used pumpkin seeds in place of the cashews, and it was delicious! Next time I will try sunflower seeds so perhaps the color will be lighter – our cheese was green. But the taste … yum. I could eat the entire container right now. Hi Elise! That is such great news! Thanks so much for sharing that. I know what it’s like to be on a restricted diet and crave something. Nothing makes me happier than to hear that my recipes have some how been able to satisfy a culinary desire for someone while not inflicting the discomforts and adverse health effects of their traditional counterparts! 🙂 Great idea with subbing the pumpkin seeds — I’ll definitely be trying that! Excellent! thanks a lot! Can I freeze it?